After all the fun and games with the crank and bearings, these were much simpler. 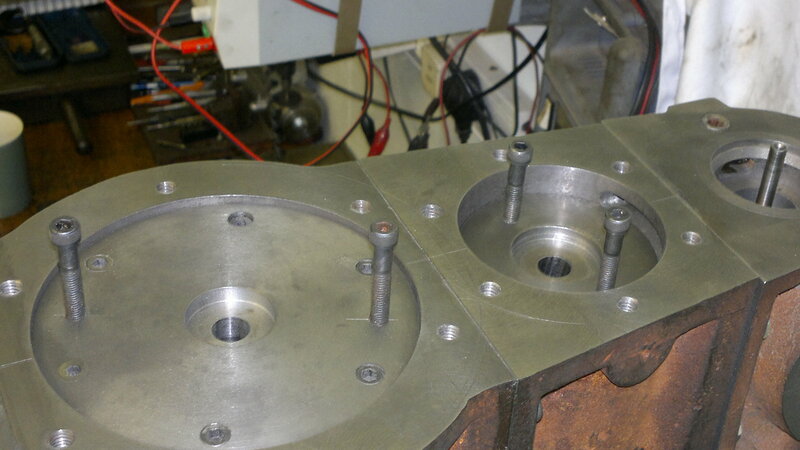 The rough castings are turned to a rough oversize, and bored for the piston rods, and the first ring grove cut all at one setting (to ensure concentricity), then switched end for end (in the case of the HP one) and the other end (top) machined oversize too, and the 2nd ring grove cut. IN the case of the LP piston, almost the same process was followed, except that it comes in two parts, which first get joined. This is to make the LP piston hollow and lighter. Once the pistons are rough finished, and ring groves cut, then a dummy piston rod is made and used as a mandrel. Because this is cut and then used without removing from the chuck, and the pistons are mounted on it in the same way they will be fitted to the real piston rod, you can take a final skim over the outside (bore face/skirt) and know everything is true. Lastly, a small file was used to gap the rings into the bore, and it all went together just perfectly! Time will tell! 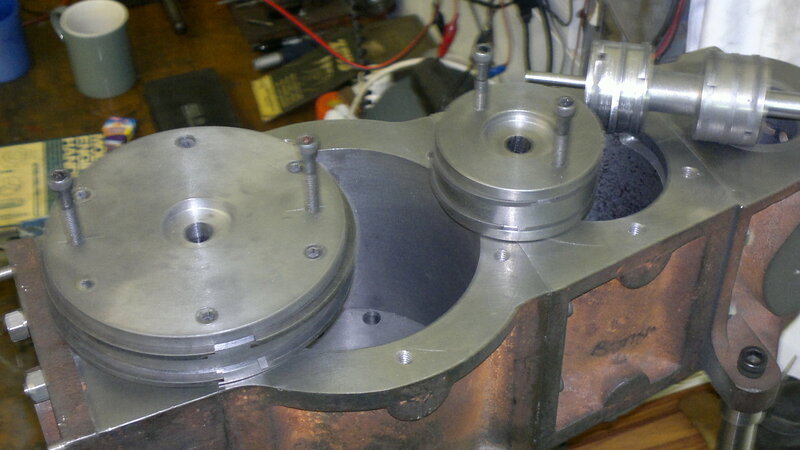 HP and LP pistons with rings – ready to be fitted. A nice simple turning job. This entry was posted in The Power Plant and tagged piston on September 30, 2012 by sybefur. Fantastic progress and looking good.